Dr. Anne Tran was born and raised in Massachusetts. She received her Doctorate in Dental Medicine (DMD) at Boston University. 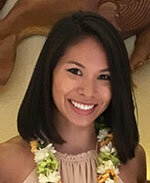 Following graduation, Dr. Tran decided to take a leap of faith, packed her bags and moved more than 5,000 miles away from home to Honolulu, where she completed her residency in Advanced Education of General Dentistry. Upon finishing residency, she fell in love with “the land where palm trees sway” and chose to stay in Honolulu to see where life takes her next. Dr. Tran enjoys baking and singing karaoke and will always bleed Boston. #GoSox #Patsnation! As a general dentist, I am very excited to join Diamond Head Children’s Dentistry. I am looking forward to working with teens as they transition into young adulthood. My goal as an oral practitioner is to set up patients for success in oral health, to be proactive rather than reactive. It’s all about education and prevention. Let’s work together so that you’ll spend less time in the patient chair and more time making memories outside the dental office! Thank you and I look forward to meeting you all!